for $399,000 with 3 bedrooms and 2 full baths. This 1,742 square foot home was built in 1985 on a lot size of 88 X 120 X 120 X 88. 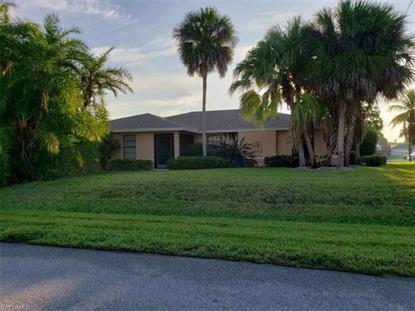 Beautifully located in a sought after area of Cape Coral, also known as "Paradise". This home is on a direct access canal, cul de sac over-sized corner lot in Gold Coast Estates off Everest Parkway. Just minutes from the Mid-point Bridge. Gorgeous pool with paver deck and boat lift. Home has been remodeled to include custom French pattern stone flooring, wood look tile planks in bedrooms, newer tile in guest bath shower with frame-less shower doors, newer stainless steel appliances, front load washer and dryer, new cabinets, granite counter tops and stone back splash. New roof in 2012, upgraded molding and cathedral ceilings. Best producing and tasting mango tree ever! Quiet and safe neighborhood Must see! Furniture is negotiable.